Our range of products include hplc syringe, hamilton gas tight syringe, hamilton syringes, gc syringe sge and gas chromatography syringes. Leveraging upon our experience and dexterous professionals, we have been able to offer a superior quality range of HPLC Syringe. Known for dimensional accuracy, high tensile strength, robustness and elevated durability, this Hamilton is manufactured by our vendors professionals using high quality raw material in sync with the international standards. Our clients can avail this product from us in varied specifications as per their specific needs at the very nominal price. Ideally suited for dispensing volumes from 1µL up to 500µL, the Hamilton Gas Tight Syringe can be used for dispensing gases as well as liquids. Further, the syringe comes with tested & precision-machined PTFE plunger tip that provides for leak-free sealing support as well as ensures no sample presence in barrel, thus safeguarding from issues like plunger freeze while handling heterogeneous samples. 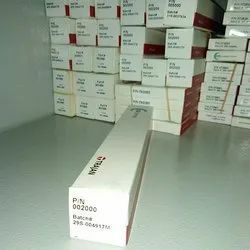 Some of its features include option of sterilizing syringes on gas, coming with different needle point choices and terminations like cemented & removable needle, PTFE luer lock and others; providing for tight fit and others. 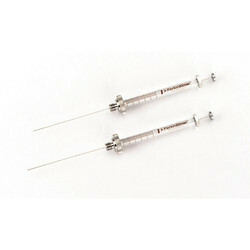 Available in different styles, Hamilton Syringes offered provide for high working accuracy within ±1% of nominal volume. Further, its stainless steel, PTFE/borosilicate glass composition also meets the requirements of chemically inert fluid path. 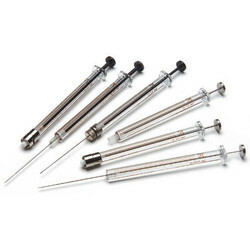 We can offer a wide variety of Hamilton syringes that include Gas/Liquid syringes in 1000 Series, 1700 Series, 1800 Series and Liquid syringes in 600 Series, 700 Series, 800 Series, 900 Series and 7000 Series. Finding use in processes involving complete loop filling, reverse loop filling and partial loop filling, the Gas Chromatography Syringes can be used in different GC applications. 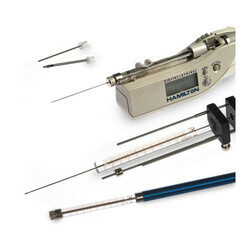 Some of these applications include on-column and split/split-less injection technique, capillary & packed column processes, in headspace sampling and others. Some of its advantages include providing for improved sensitivity of MS analysis, low syringe carryover, enhanced analyte recovery, reduced non specific sample interaction, smooth removable needles and meeting critical auto-sampler specification as demanded in the process.